Reported Newcastle United transfer target Andrej Kramaric has had a €50m price tag slapped on his head by club Hoffenheim. The Magpies have been credited with an interest in the former Leicester City striker this summer, but it would appear that the Croatian international is out of United’s price range. Speaking to German publication TZ, Hoffenheim sporting director Alexander Rosen said: “I never rule out anything – that’s not in our business. “We had an offer of €30m (£26.3m) for Andrej from Italy during the winter the break. Manager Rafa Benitez is keen to add at least one new striker to the United ranks this summer, with question marks over the future of both Aleksandar Mitrovic and Dwight Gayle. Gayle has been subject to interest from recently relegated Stoke City, who are pumping cash into their squad in the hope of achieving promotion at the first attempt. 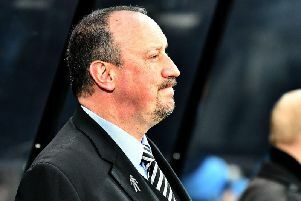 With Mitrovic almost certain to depart, Gayle, with Joselu, are the only two strikers on the books and Benitez is unlikely to sanction the sale of one, without a replacement lined up. Mitrovic, away at the World Cup with Serbia, is wanted by Fulham, with United looking to recoup at least £20m for their striker, signed from Anderlecht for around £13m three years ago. Whoever leaves, bringing in a striker of Kramaric’s calibre could prove almost impossible for Benitez, with the Spaniard working under tight constraints yet again, despite the club’s coffers being lined with Premier League TV money over the last 12 months. The Croatian has netted 102 times in 179 games for the Bundesliga outfit since leaving the Premier League.